Photo by Rolf Hicker: USA Pictures. Yosemite National Park holds unique and pronounced landform features, in the form of deeply incised valleys and granitic domes. The park is also known for its many waterfalls and groves of giant sequoias (possibly the oldest and largest living things on earth). 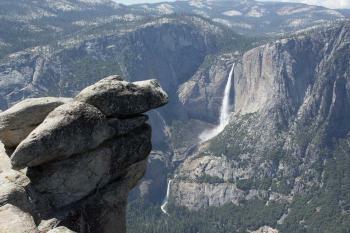 The geology of the Yosemite area is characterized by granitic rocks and remnants of older rock. About 10 million years ago, the Sierra Nevada was uplifted and then tilted to form its relatively gentle western slopes and the more dramatic eastern slopes. The uplift increased the steepness of stream and river beds, resulting in formation of deep, narrow canyons. About 1 million years ago, snow and ice accumulated, forming glaciers at the higher alpine meadows that moved down the river valleys. An incredible park - one of the best in the US. However, it is super busy in summer and holiday periods and that definitely takes away from the enjoyment. I would suggest planning a visit out of peak season. Also, if you can, take a bit longer in the park and get away from the obvious spots. The area is big enough for everyone, but for some reason people seem to congregate in the same places! 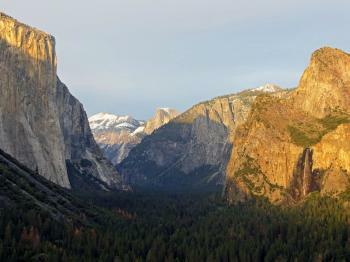 Half Dome, El Capitan, Yosemite Falls, Glacier Point -- the Yosemite Valley is packed with spectacular natural sights. The beauty of this area led citizens to petition Congress to designate the valley and nearby Mariposa Grove as a California state park in 1864, setting a precedent for the later formation of the U.S. National Park system. 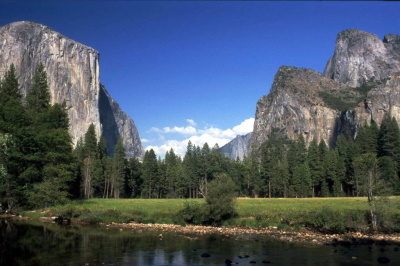 Yosemite became a national park in 1890, and just celebrated its 125th anniversary last month. Although I'd heard a lot about the crowds at Yosemite in the spring, the number of visitors wasn't too daunting when I visited mid-week this past April. The Yosemite Valley is full of great hiking trails, but I stuck to ones easy enough for my friend's one-year-old son to navigate. The trails along the Merced River offered the awesome backdrop of Yosemite Falls and peaks like El Capitan, while the Mirror Lake trail took us below Half Dome. Glacier Point opened early this year, so we were unexpectedly treated to a spectacular view of the valley below. Don't miss the Tunnel View overlook on the way back down to the valley for an iconic Yosemite panorama. This is one of my favorite national parks in the U.S. Logistics: Yosemite is most easily reached by car, though you have the option to use the free Yosemite Valley shuttle service inside the park. Yosemite is incredible. Visit in the spring when the snow melt fills the falls to the max. There are few people so the visit to the valley at that time is just spectacular! Firstly, two days in the park is highly recommended. Anyone who complains the park is too full of tourists likely only visited the park for one day and spent most of their time in Yosemite Valley, which does get fairly busy. Once you get to the northern section of the park the traffic slowly dwindles and you are once again in wilderness. My wife and I had whole lakes, meadows, and forests to ourselves (especially if you get going early). 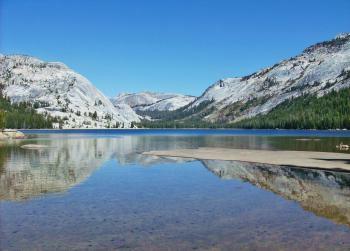 We layed out a nice picnic alongside Tenaya lake which reflected the majestic mountains. Its difficult to describe how amazing Yosemite really is. Treat yourself and enjoy the whole park in more than one day. Between 2009 - 2013 I've made 3 trips to the park. Late Spring/Early Summer is peak season, the waterfalls in Yosemite Valley are in full glory, but so are the tourist crowds. Many of these visitors only go to Yosemite Valley. I would recommend many visitors to consider a Fall visit to the park. Yes, no waterfalls (maybe a trickle). Yosemite Valley is beautiful, but I would argue the top of the valley is more impressive than the bottom. Taft Point and Sentinel Dome located on Glacier Point are incredible. Yosemite is really beautiful and is a worthwhile destination. My favorite was the Half Dome. I took many photos of it as the sun was setting. I have yet to see the sun set like that again. The colors in the sky were amazing - pink, orange, blood red, and purple. I also saw a bear and a wolf, which was very exciting! I had a hard time leaving Yosemite and would love to visit again, but there are so many other sites to see! off by the traffic and the thousands of tourists. for the year. The gigantic trees were interesting though. I really enjoyed my visit to Yosemite, it is defiantly not a wilderness anymore but it is worth going out of your way for, but be warned it is very busy. The view of the Yosemite Valley from Glacier Point (pictured) is the centre of the park, and is a pretty inspiring sight. The sheer face of Half Dome was being scaled by a group of intrepid climbers whilst we were there and it provided a great sense of scale; how small they were compared to the rock face. The part of the park I most enjoyed was the groves of giant sequoias, they were absolutely massive, I remember being really impressed by the up-turned roots of one of the trees, and being frustrated that I couldn't fit them all into one photo. We stayed at a nice place called outside the park called Jamestown, in a hotel that had the train from Back to the Future III in it, I spent most of my time watching humming birds feeding next to the swimming pool and also remember visiting the Gold Rush town of Columbia. I really enjoyed California, it is a very easy place to visit if you have your own transport and has some great places to visit and Yosemite was a highlight (though I also have to give an honourable mention Monterey especially the Crown and Anchor Pub!). The ease of travel however means that it is very busy, the main routes especially, I think if you are used to less visited natural sites you will have to work harder to get some peace and quiet here, but for the casual tourist this is a great site. Flocks of tourists aside, the Yosemite Valley is truly one of the most stunning landscapes this planet has to offer. The sheer face of El Capitan on one side and the curved top of Half Dome on the other makes this spot one of my favorite in California and the entire US. I have visited Yosemite in both summer and winter. In winter it is magical, with the trees covered in icicles and the waterfall a frozen beard hanging way up there. There are next to no visitors around in winter, but the shuttle buses still operate along the valley . And the bus runs to Yosemite from Merced station even in winter, when it need chains on its wheels to get through. This truely is a beutiful place, especially if you can get away from the main tourist routes. but even if you can't due to limited time it is stunning, the views over Glacier Peak and the giant Redwoods are truely awe-ispiring. I wish i could go back and spend more time there. Joanne and I were so taken by the park that it seemed like heavin on earth to us and we almost cried at the thought of so much beauty in one location. Truly this was God's masterpiece of creation. We both envied the Native Americans who found it and lived there. Reintroduced Species: Bighorn sheep: Bighorn were first reintroduced to Yosemite National Park in 1986. These small herds still persist, and can sometimes be seen summering along the Sierra crest, on such peaks as Mount Dana and Mount Gibbs. However, the areas inhabited today represent only a fraction of the bighorn sheep's former range, and until a more robust population is established, one of Yosemite's greatest wilderness icons will remain at risk. Between March 26 and March 29, 2015, nine ewes (females) and three rams (males) were moved from the Inyo National Forest and Sequoia National Park to the Cathedral Range in Yosemite National Park. In addition, seven ewes were moved to the Laurel Creek area of Sequoia National Park; the CDFW will attempt to move an additional three rams to that area on March 30. Holocene: Yosemite as seen today is primarily a "post glacial" creation. "When the last glacier finally melted approximately 10,000 years ago, rock debris dammed the valley and created Lake Yosemite. Tributary creeks plummeted off sheer cliffs and gave birth to the Park's famed waterfalls. Sediment continued to fill the lake through natural processes until it eventually formed the Yosemite Valley floor." 369 Community Members have visited.